I know I saw someone on SB Canning ask "What does Pear Honey taste like?" Well, now I know! It tastes a little like honey flavored pears! It is so yummy!! I made some tonight to enter into our state fair and OMG! I'm in heaven with this!! It has the consistency of applesauce and is heavenly! I also made Scuppernog Jelly but wanted to put a 'twist' on it so we 'flavored it' by adding almond extract and to partake a slight 'honey flavor' I added amber colored Raw Agave Syurp. So, so, so good!! And the color of the jelly is simply beautiful!! 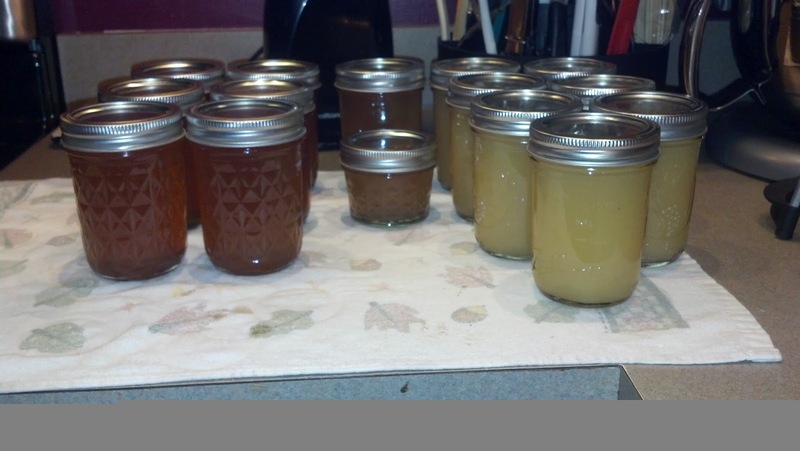 When I made the 'juice' for my Scuppernog jelly, I had plenty left and was able to jar the remaining juice. 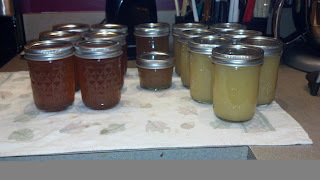 The jars on the right are the Pear Honey, the middle jars are Scuppernog Juice and the jars on the left are the Scuppernog Jelly with Almond Honey 'flavor'. Here are the recipes and a photo!! 1. Wash, pare, and core ripened pears. Slice and measure. 2. Put the pears through a food chopper using a fine blade or a blender (or use an immersion blender once cooked if you don't have one). 3. Add pears to stainless steel pot. Add remaining ingredients to the pears. 4. Cook over low heat stirring frequently for 20 minutes, or until desired consistency. 5. Pack into hot sterilized jars leaving 1/4" head space, remove air bubbles, wipe rims, add hot lids/rings. 6. Process in water bath canner for 10 minutes once the water has returned to a full rolling boil. 1. "Juice" the grapes using a steam juicer (follow the directions of your particular model). You need 5 1/2 cups of juice from them (you can add plain white grape juice to get to this amount if needed but you shouldn't have to). 2. Combine juice with sugar, lime juice, almond extract, and agave syrup to a pot and bring to a boil. 3. Simmer for 10 minutes melding all flavors together. 4. Whisk sure jel into the liquid and boil for 1 minute. 5. Skim foam off the top. 6. Ladle into prepared jars and water bath for 10 minutes. 7. Makes 6 half pints. **note: Scuppernog or Muscodine grapes have a very, very tough skin. Mashing them and using a juicing 'bag' is tedious and hard work! I highly suggest using a steam juicer for these grapes! !